According to one teardown of Apple's Time Capsule released earlier this week, the hard disk drive inside the wireless base station is a consumer version, not a server-grade disk as advertised by Apple. French Mac site MacBidouille tore down Apple's fourth-generation Time Capsule. The 2TB Time Capsule received by the publication featured a Western Digital Caviar Green HDD. Various publications have noted that the WD Caviar Green model is generally considered consumer class. However, on its website, Apple advertises the Time Capsule as having a "Serial ATA server-grade hard disk drive." According to MacNN, a comparable server-grade model to the Caviar Green would be the RE4-GP. However, the RE4-GP does not have a 3TB option. Apple quietly released the new Time Capsule on Tuesday, adding a 3TB model and discontinuing the 1TB option. Hints of upcoming Time Capsule and Airport Extreme refreshes were discovered inside a routine Airport Utility update earlier in the month. The first-generation Time Capsule from 2008 used a Hitachi Deskstar, which was also criticized as not being server-grade. 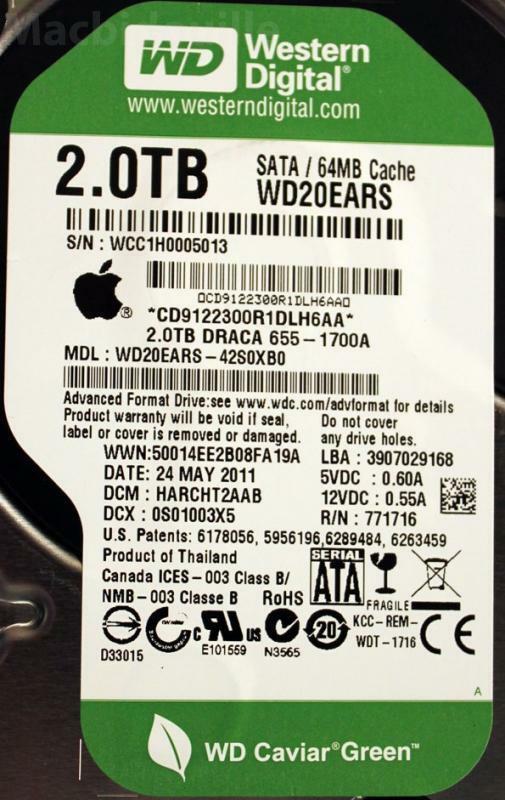 The 2009 model used a Western Digital Caviar Blue drive. The rest of the teardown revealed no other significant changes, though the publication claims that the addition of rumored features, such as a private cloud, an iTunes server for the network, or local storage of software updates, "will certainly come later via a firmware update of the terminal." Apple also quietly released a new Airport Extreme model on Tuesday. While the company doesn't advertise any specific changes to the device, AppleInsider reported on Thursday that Apple's filing with the FCC for the new Airport Extreme revealed the base station may have as much as a 2.8 times power boost over its predecessor. That power boost could theoretically provide a 60 percent increase in range, but real-world usage will vary.